How To Deal With Spam In Skype? Since in Skype there are millions of users from all around the world, it is only natural spam to appear too. Maybe you have received from time to time a message with a link to a Russian online dating site, or something like that :). 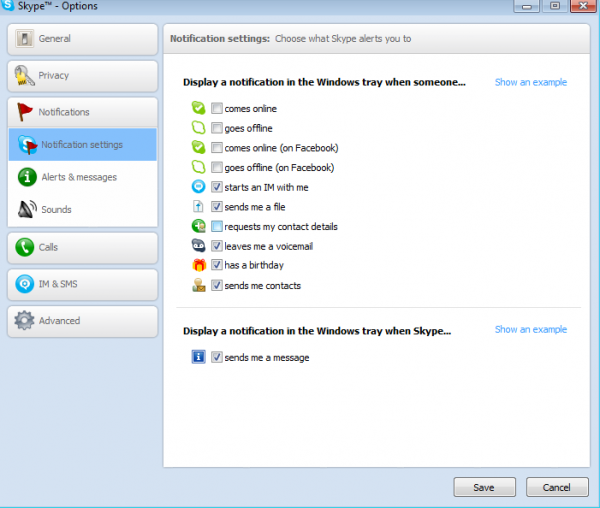 In this article we will take a look at some tips, that you can follow, if you want to deal with the spam in Skype. 1. Maybe the most important thing is to set up Skype in a way, that you do not receive messages from people outside your contact list. In order to do that, open Skype, sign in with your name and password, now go to the menu Tools, then Options and click Privacy. Now on each place choose People in my contact list only. Click Save. 2. The next tip is what not to do. Do not click on links sent to you from people you don’t trust or know. And even if it is from a good friend, don’t click right away. Look at it first. Does the URL seem suspicious? 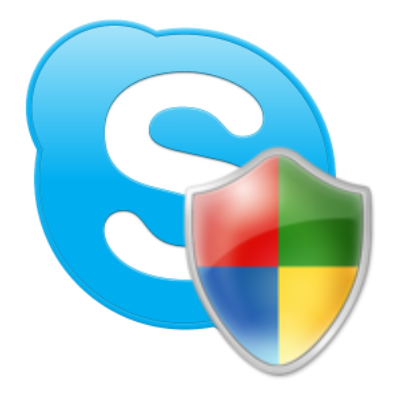 Keep in mind that there are Skype viruses that will send you spam messages from your friends, without their knowledge! If it is a weird message with a link, or just a link, then think twice before clicking. Ask them a little more about the link before clicking. The virus cannot understand what you are talking. If your friend just says, that he/she does not know what you are talking about, then it is obvious that he/she did not sent that. Also never click on links that are pointing to an executable file. They have “.exe” at the end. 3. Another thing you can do is to block users that you do not know and that have spammed you before. This way at least they will never spam you again. Also report them to Skype. 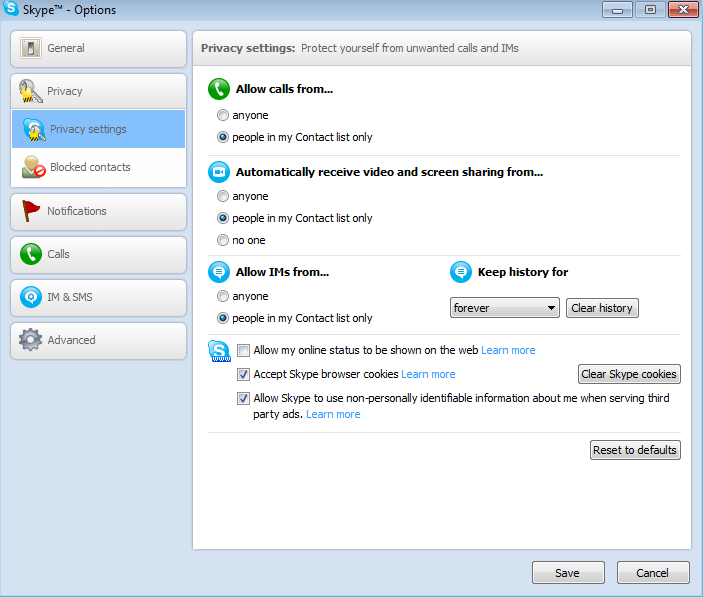 The report option is not available in older version like Skype 3.8, but you can still block users. 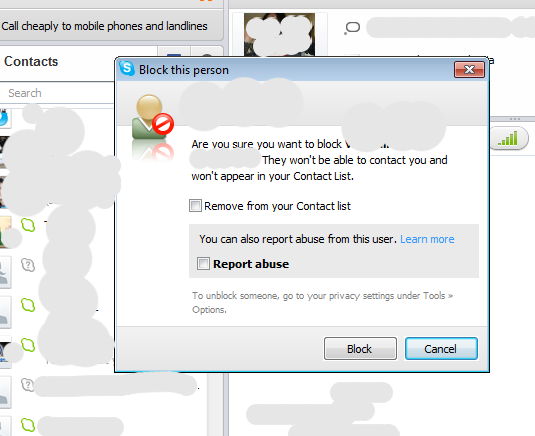 In order to block a user, right click on it and choose Block this person …, now check Remove from contact list and Report abuse and click Block. 4. Another useful tip is not to share with anyone your Skype password. If someone requests your password in an email for example, pretending to be from Skype, do not trust him/her. The people at Skype will never ask you for your password! If the spammers some how get their hands on your password, they can start sending spam from your account. 5. And the last thing I want to talk about it the kind of spam that is basically people adding you to their contact list and requesting the same from you. If you have this kind of problem you can disable this notification. But keep in mind that if you do that, you will never know if someone wants to add you to his/her contact list. To disable this kind of notifications first open Skype and sign in with your name and password, then go the menu Tools, now Options and click Notifications. Uncheck requests my contact details and click Save. That is all. If you have some other tips or some experience with the spam in Skype, please share your thoughts in the comments below :).